Television system by country. 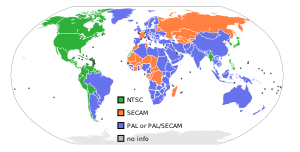 Countries using the PAL system are shown in blue. The PAL region is a television publication territory that covers most of Asia, Africa, Europe, South America and Oceania. It is so named because of the PAL (Phase Alternating Line) television standard traditionally used in those regions, as opposed to the NTSC standard traditionally used in Japan and nearly all of North America. During the mid-1990s, the practice of modifying consoles such as the Super NES and Mega Drive to allow 60 Hz operation became somewhat common among PAL gamers, due to the rise in NTSC/60 Hz capable PAL TVs and the relatively simple nature of the modifications. Beginning with the Amiga CD32, which introduced more powerful hardware, developers had the ability to output at full PAL resolution without borders or stretching, although games still typically ran slower and all ran at 50 Hz. Beginning with the Dreamcast and continuing through the sixth generation of consoles, developers began including PAL60 modes in their games. Games that run at PAL60 are produced with the same colour encoding system as 50 Hz PAL signals, but with the NTSC resolution and field rate of 60 Hz, providing an identical gaming experience to their NTSC counterparts, however some games, such as Tekken 4 and Tekken 5, will actually use the NTSC color mode when in 60 Hz mode; these games will appear in black and white on PAL-only televisions. Games ported to PAL have historically been known for having game speed and frame rates inferior to their NTSC counterparts. [according to whom?] Since the NTSC standard is 60 fields/30 frames per second but PAL is 50 fields/25 frames per second, games were typically slowed by approximately 16.7% in order to avoid timing problems or unfeasible code changes. FMV rendered and encoded at 30 frames per second by the Japanese/US (NTSC) developers was often down-sampled to 25 frames per second for PAL release—usually by means of 3:2 pull-down, resulting in motion judder. In addition to this, PAL's increased resolution was not utilised during conversion, creating a pseudo letterbox effect with borders top and bottom, which looks similar to a 14:9 letterbox, and leaving the graphics with a slightly squashed look due to an incorrect aspect ratio caused by the borders. This was especially prevalent during previous generations when 2D graphics were used almost exclusively. The gameplay of many games with an emphasis on speed, such as the original Sonic The Hedgehog for the Mega Drive, suffered in their PAL incarnations. Despite the possibility and popularity of 60 Hz PAL games, many high-profile games, particularly for the PlayStation 2 console, were released in 50 Hz-only versions. Square Enix have long been criticised by PAL gamers for their poor PAL conversions. Final Fantasy X runs in 50 Hz mode only, and 16.7% slower and bordered that while prevalent in previous generations was considered inexcusable at the time of release. In stark contrast, the Dreamcast was the first system to feature PAL60, and the overwhelming majority of PAL games offered 50 and 60 Hz modes with no slowdown. The Xbox too featured a system-wide PAL60 option in the Dashboard, with almost every game supporting PAL60. Seventh generation PAL consoles Xbox 360, PlayStation 3 and Wii also feature system-wide 60 Hz support. Nintendo's Virtual Console service has been criticized due to PAL games running in 50 Hz only, despite the ability to run in 60 Hz mode. In recent years, few PAL releases have lacked the standard PAL mode and offered 60 Hz only, notably Metroid Prime 2: Echoes and Geist for the Nintendo GameCube, and Dead or Alive 4 for the Xbox 360. As of the eighth generation, consoles such as the Wii U, PlayStation 4, Xbox One and Nintendo Switch have all games exclusively in 60 Hz, with 50 Hz only being used for video playback and, in the Wii U's case, backwards compatibility with Wii and Virtual Console games. ^ "PAL Virtual Console games slow and bordered - VideoGamer.com". videogamer.com.